The Ireland-Claisen rearrangement is an organic reaction used to convert an allyl ester to a γ,δ-unsaturated carboxyl acid using LDA, TMSCl, and NaOH/H2O. 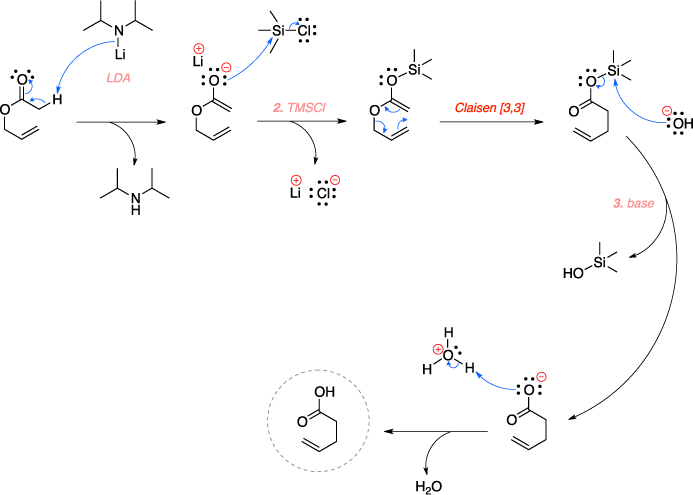 The reaction begins with deprotonation of the α-hydrogen of the ester to form an enolate which then attacks TMSCl to stabilize the charge and produce LiCl salt. The two olefin groups are ideally positioned for a Claisen rearrangement, which results in the formation of a carbonyl group. Deprotection of the TMS group with base and protonation then results in the final carboxylic acid product. Ireland, R. E.; Mueller, R. H. J. Am. Chem. Soc. 1972, 94, 5897–5898. Ireland, R. E.; Willard, A. K. Tetrahedron Letters 1975, 16, 3975–3978. Ireland, R. E.; Mueller, R. H.; Willard, A. K. J. Am. Chem. Soc. 1976, 98, 2868–2877.